Seattle is known for many things—for major attractions like the Space Needle, for amazing outdoorsy activities within and near the city, and for fresh and local foods. But something that defines Seattle more than anything is its location. Sandwiched between mountains to the east and the Puget Sound to the west, Seattle’s location is what opens up much of the amazing things to do in the area. This includes whale watching. While many whale watching tours depart out of Everett, Anacortes or the San Juan Islands, whale watching tours can and do leave from Seattle as well. Here's what you need to know to go whale watching in and around Seattle. The Puget Sound is home to a few species of whales, including humpback and orcas. Venturing out onto the water to get up close (well, within reason…you don’t want to get too close) and personal with the Sound’s largest residents is an exciting day activity that you can do from a few points in and north of Seattle, and it’s a great way to get in touch with what the area is all about. Since whales can’t exactly be scheduled to show up, the worst-case scenario is that you get a day out on the water viewing all kinds of wildlife—you’ll almost always spot seabirds, seals or sea lions, porpoises, and other native wildlife, if not whales. If not spotting a whale a concern to you, make sure to ask what happens if no whales are spotted and how you’ll need to reschedule. Many companies will offer you another tour if you don’t see a whale. If this is important to you and the company you're talking to doesn't offer a free return trip, find another company because many do. While orcas get most of the attention as far as whale watching goes, they’re far from the only whales in the Puget Sound. Orcas can be spotted just about year round, but are most common in the spring and summer. And they are pretty thrilling to see with their distinct black and white markings. More than any other whales, orcas have become a symbol of the Puget Sound and Western Washington in general. Adult orcas are 25 to 30 feet long and there are three pods of orcas that spend time in the Puget Sound – J, K and L pod. Often, tour leaders can tell you which pod you’re looking at as well as which whale, based on their markings. Minke and Humpback whales also coincide with the peak orca season, so if you go on a tour between May and October, you might see any number of whales. Many whales make regular appearances in the Sound, though. Gray whales are also common, especially in March and April. Gray whales migrate between the Baja Peninsula and Alaska but stop in to say hi to Puget Sound residents on the way. Joining a whale watching tour makes spotting whales of all sorts much more likely. Tour leaders have resources that help them know where the whales are hanging out each day, but that doesn't mean it's the only way to go whale watching. With some research and planning, you can go whale watching in Seattle and other Puget Sound cities on your own. Orca Network is an organization that raises awareness of whales and their habitats in the Northwest. 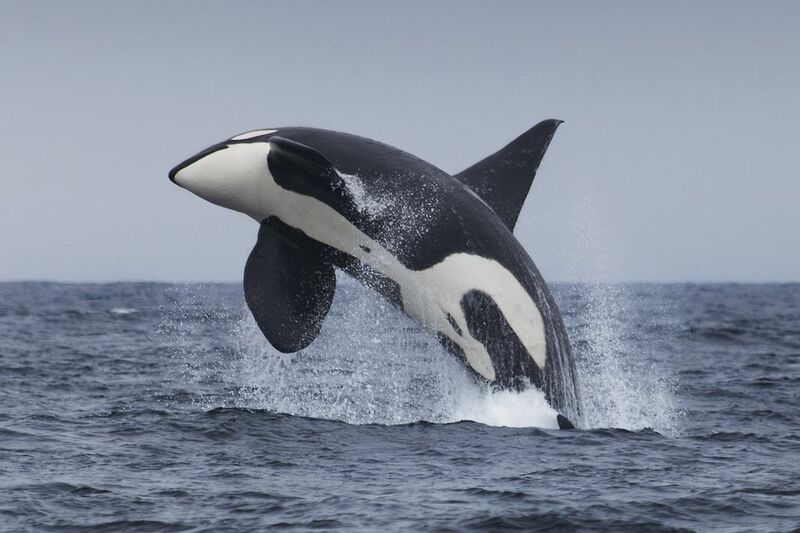 The site overall is a great place to learn about and support our favorite finned residents, but it's also the best way to keep track of where Orcas, other whales, and porpoises are being spotted. If you keep a close eye on the sightings reported on the site, you can get an idea of where whales are and watch for yourself. Sightings can be made from shore, but it helps to have a little elevation. Places like Point Defiance or Discovery Park give you that elevation and make great watchpoints if you see sightings in either area. Many whale watching tours leave from points north of Seattle, but there are some trips you can catch right from Seattle. Clipper Vacations offers one of the most popular and pairs whale watching time with a few of its destinations. You’ll get two or three hours out on the water looking for sea life, as well as time in Whidbey Island, Friday Harbor, Victoria or other destinations. Another company that leaves out of Seattle includes Puget Sound Express, which takes you up to the San Juans like Clipper Vacations does. While these tour companies do leave out of Seattle, it’s rare for tours to spot whales so close to the city. In general, count on a journey to the north. And yet another option that pairs a unique experience with whale watching is taking a Kenmore Air flight out of Seattle to the San Juans, where you can board a whale watching tour. The seaplane company takes off out of Lake Union and offers package deals that combine a flight with a whale watching experience. Most whale watching tours don’t leave directly out of Seattle. And, if it’s options you seek, look to the cities to the north for all kinds of companies that run whale watching tours. Popular embarkation points are Everett, Anacortes, and Port Townsend, all of which are closer to the San Juans area than Seattle, meaning you’ll often have more options for tours that spend more time on the water as they don’t have to make a return trip to Seattle. Everett is the closest embarkation point to Seattle at about 45 minutes away. Anacortes is about two hours away, as is Port Townsend. To get to Port Townsend, you’ll either need to drive all the way down around the bottom of the Puget Sound and then back up north again, or take a ferry, so it’s really not the best option. If you want to extend your whale watching experience, there are also a number of whale watching tours out of the San Juans from Friday Harbor and Orcas Island. Most whale watching tours involve getting onto boats of various sizes that carry anywhere from 20 to 100 people. These boats usually provide both indoor and outdoor seating and standing space, which is especially ideal if you’re going on a tour in March or April (don’t underestimate how chilly it can be out on the water). Depending on what you prefer, you can find companies that match the experience you want to have, whether that’s a smaller boat, a boat with lots of indoor seating, or a boat with lots of deck space so there’s nothing between you and the open water. If you leave out of the San Juans, you’ll even find options like sea kayak tours and Kestrel tours on a high-speed, low-to-the-water open craft with San Juan Safaris or San Juan Excursions.